It has been a while since I last wrote. Caught up in the hustle bustle of life, my writing took a backseat. 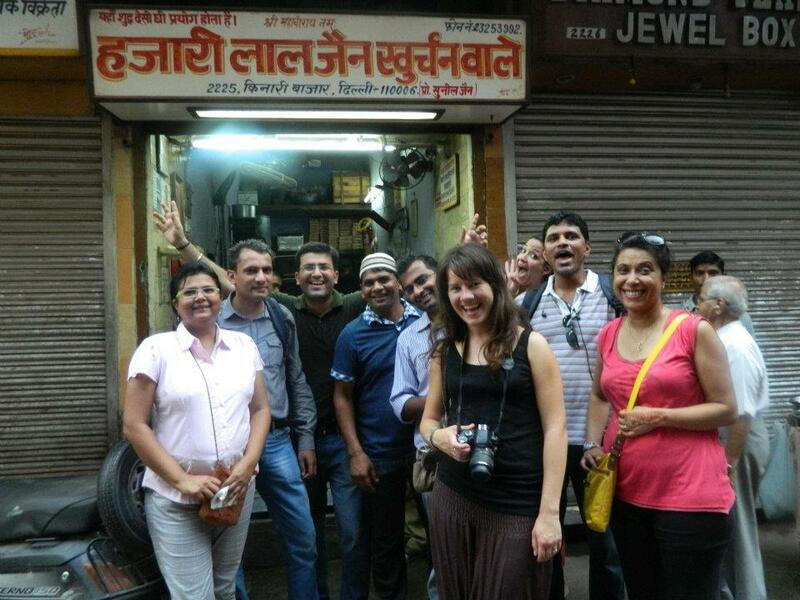 But, one short trip to this delectable chaat corner in Kamla Nagar tempted me to get back to my computer. 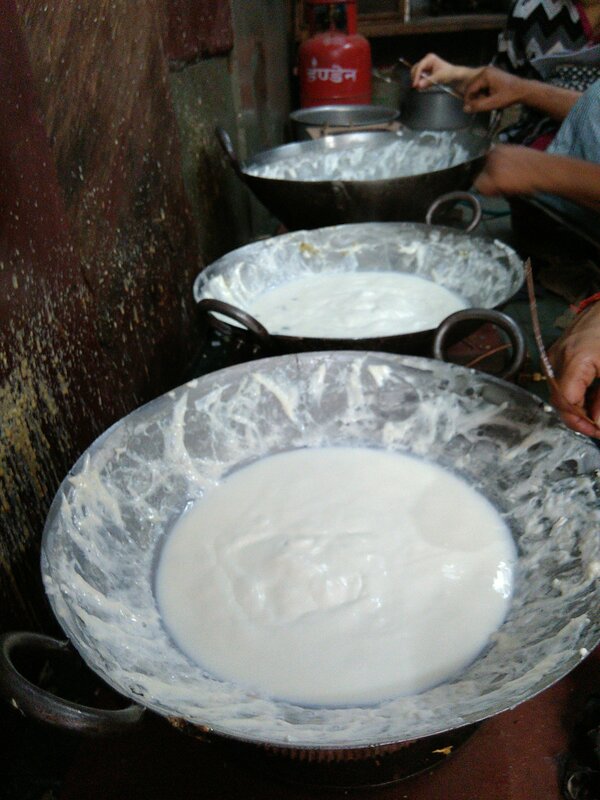 Being majorly populated by the Baniya and Marwari community, most of which are vegetarians, Kamla Nagar is a hub of varied vegetarian delicacies. In my college days, I remember, I used to frequently visit Brijwasi restaurant, where all the dishes, ranging from appetizers like tikkis and samosas, to rajma and kadi are cooked without onion and garlic. Another small eatery near the gol chakkar – ‘Miglani Dhaba’ created a blast in our taste buds with their paneer bhurji and dal fry, with soft tawa rotis, bringing us a tasty escape from the torturous culinary experience at the hostel mess. The shop is co-owned by Mr. Vinod and Mr. Pramod, who used to work in the same shop 15 years ago as employees, and later took it over from the owners 8 years ago. The puchkas are a bit different from the regular gol gappas. Puchkas are made of wheat flour, and are filled with a spicy mixture of mashed potatoes and kala chana, and topped with tamarind water, while gol gappas are mostly made up of semolina or only wheat flour. Even though gol gappas have their own charm, puchkas seem to have made a special place in my heart. As mentioned, puchkas are filled with masala aloo chana and served with imly ka paani, giving a real punch to the taste buds. Another unique variety of puchkas that we encountered were onion puchkas – where chopped onions are added to the normal aloo masala, giving it an oomph factor. After the delicious puchkas, I moved on to the next popular snack of Bihar and Calcutta, churmur– which is a sort of hybrid of puchkas and aloo chaat. It’s a tangy, crunchy and sweet concoction featuring chickpeas, tamarind water, boiled potatoes, crushed puchkas, green chillies, and black chana. Quite the delicacy! 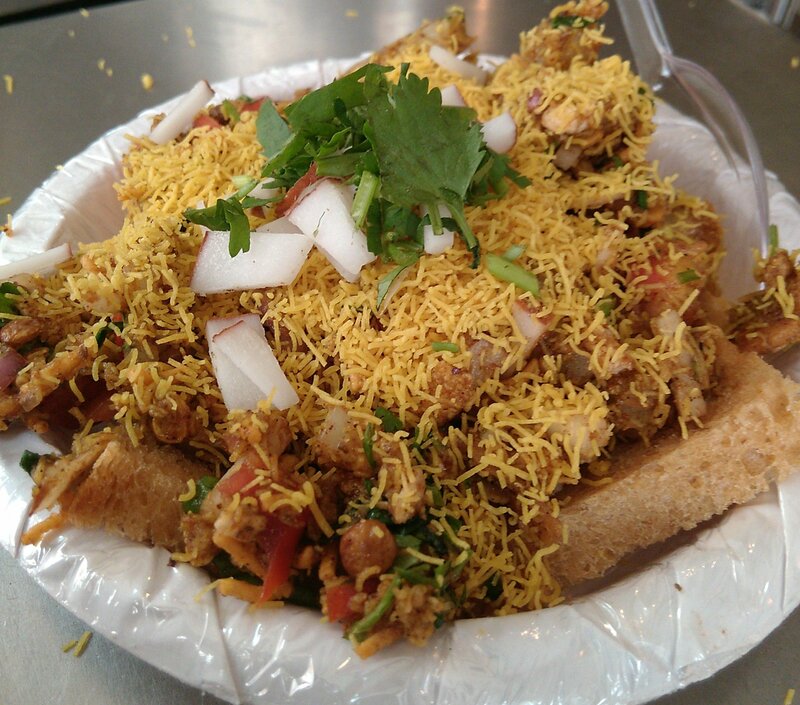 Another dish that made us drool at Calcutta Chaat corner was the kacha sandwich. First, a piece of brown bread is cut into 6 small pieces. Then a mixture of sev puri is spread evenly over the bread. Finally, this is garnished with small pieces of coconut and coriander leaves. The pieces of bread are cut such that they fit into the mouth perfectly. The soft bread and the crispy masala sevpuri with the tangy sauce makes it a combination like no other. In the drinks, I ordered the most unusual sounding masala thumsup served in a big lassi kulhad. In a shaker, thums-up is mixed with masala – mainly a mix of grounded cumin seeds and black salt with some lemon juice, giving it a very different flavour. 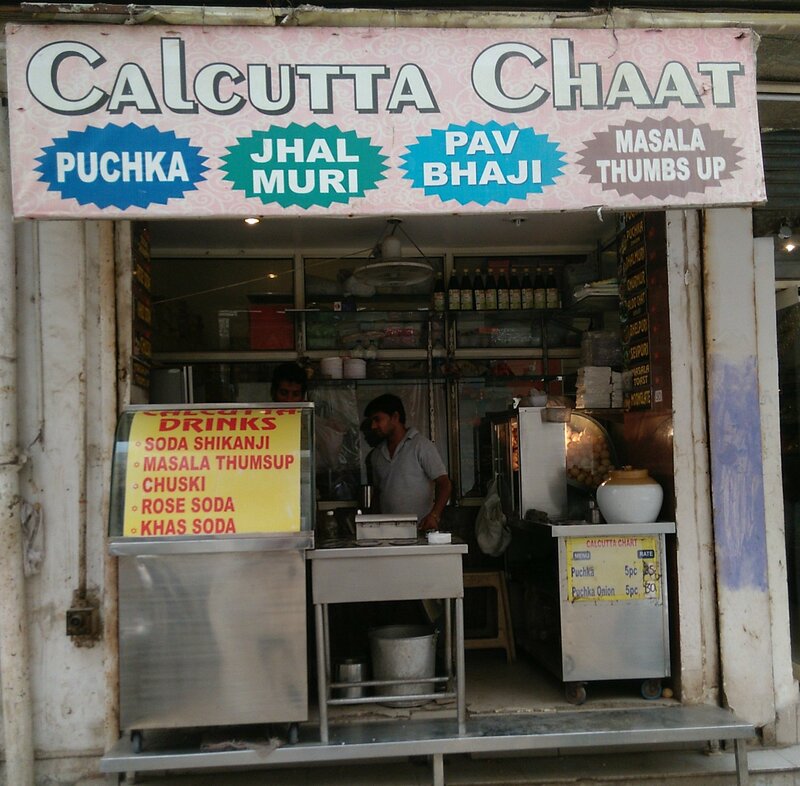 With the appetizing variety, coupled with the pocket friendly prices, I am sure Calcutta Chaat Corner will emerge as a hot favourite among the students of Delhi University, who are always looking for an affordable yet scrumptious destination to eat at. Baat niklegi toh bahot dur talak jayegi… This couplet from the famous ghazal echoes in my head whenever I have a conversation on Mughlai food with someone. The city which was once an epitome of grandeur and royalty, the remnants of its magnificence are still seen in the astounding monuments dotting the city’s skyline. But Mughlai food being a very important part of the city’s royalty seems to have got influenced over time and one can’t really find the authentic taste and aroma that once emanated from the Royal kitchens of Shahjahanabad. Not only the taste of some popular dishes like qorma and biryani has got influenced by traces of other places (Moradabadi biryani being one such delicacy that has fused in the so-called Mughlai platter of Delhi), some of the dishes that were once served to the Royalty are now probably lost…or so I thought. This was the lament that I was living with until Fate made me acquainted with Mohammed Noor who traces his roots to the Royal chefs of Shah Jahan. Nestled on the bustling road in front of Gate No. 1 of the grand Jama Masjid, Noor’s kitchen is a meek one room with a tandoor in one corner and 2-3 ‘chulhas’ with copper ‘degs’ sending out wafts of aroma into the air that tingle the tastebuds. The soot covered walls of the kitchen withholding so many secrets of lost Mughal recipes too. Noor stands out from the rest of the Mughlai cuisine chefs as he’s got the knack and art of preparing Mughlai food in his genes, for his forefathers served the Mughals seven generations ago and passed on this culinary magic to their progeny of which Noor is a flickering lamp in the city of glittery lights and glamour. Noor is the man behind the lost recipes of Mughlai kitchens. But in his own words, “ Mujhe English bolna nahi aati (I don’t know how to speak English language), and hence he feels that some big names who hog the limelight and organise food festivals in snazzy hotels exploit his talent and don’t give him much credit. Noor considers Haji Kallan as his Ustaad. 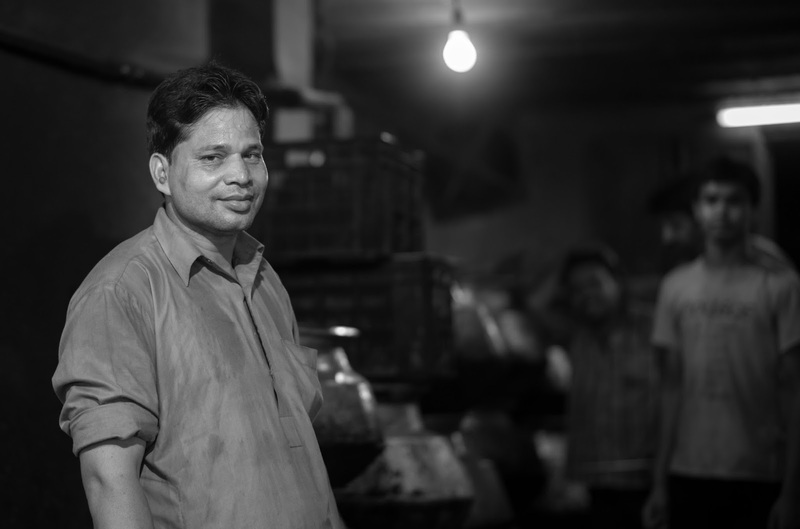 His ancestors used to work under Haji Kallan while serving the Royals and even today Noor is associated with Haji’s family as a part time cook. Name any dish of the Mughlai cuisine and Noor knows it on fingertips. Ever heard of ‘gosht ka halwa’? Yes, I couldn’t believe that mutton could be served as a dessert as well, but Noor is adept in preparing all these unique dishes. Noor plans to pass on all the secrets of these lost recipes of Mughlai cuisine to one of his sons, but only time will tell if he will get his due in a world where degree sans true talent and refined English language overshadows real worth. Very few things in life are as satisfying as a Sunday Brunch. Tamra, the coffee shop at the Shangri-La’s Eros Hotel in New Delhi offers one such Brunch. The true essence of George Bernard Shaw’s famous statement ‘There is no sincerer love than the love of food’ comes across at buffet spreads in my opinion. I certainly displayed all my enthusiasm at the Tamra Sunday Brunch when I was very kindly invited to review it. A balmy afternoon, a table by the window, a gastronomic spread as far as the eye can see and a hungry stomach, are a match made in heaven. This buffet is like many others and at the same time unlike them as well. With a kid’s room adjoining the main coffee shop the Shangri-La’s Eros Hotel provides a space for your children to play Xbox games, watch cartoons, draw and play with building blocks all while being watched over by hotel staff and with the added bonus of their very own buffet spread with little snacks and a DIY sundae counter. For once, I wished I was a kid accompanying my parents to this buffet lunch. The restaurant has a number of ‘Live Theatres’ or live cooking stations/counters as known in other places. I was rather overwhelmed. My previous visit to Tamra was for the Malaysian food festival and I have to say that this time in comparison was far better. Maybe a group lunch versus a lunch with just one other person was the deal breaker. I was accompanied by a member of the PR team and we had the most wonderful time getting to know each other with the generous help provided by Moët & Chandon Champagne throughout our decadent meal. Chef Neeraj Tyagi visited our table and explained his vision of wanting to provide new experiences for people every Sunday. The menu is rotated so that no two consecutive Sundays are the same. Chef Neeraj has also been instrumental in adding a variety of speciality dishes ranging from Sugar-free to Gluten-free and Lactose-free items. It was wonderful to see how he intends to incorporate all kinds of health food so that people with allergies can also enjoy a buffet to the best of their ability as opposed to being relegated to 1/3rd of it as is generally the case. For example my mother and grandmother are diabetic and cannot even venture near the dessert counter. They do eventually end up eating teeny-tiny portions of dessert just for some soul satisfaction. But, if they were to get a wide option of even 3 sugar-free desserts, not including fresh fruits, they would be over the moon! After a leisurely walk around the restaurant to see what was on offer I decided to begin my journey with the Japanese section. 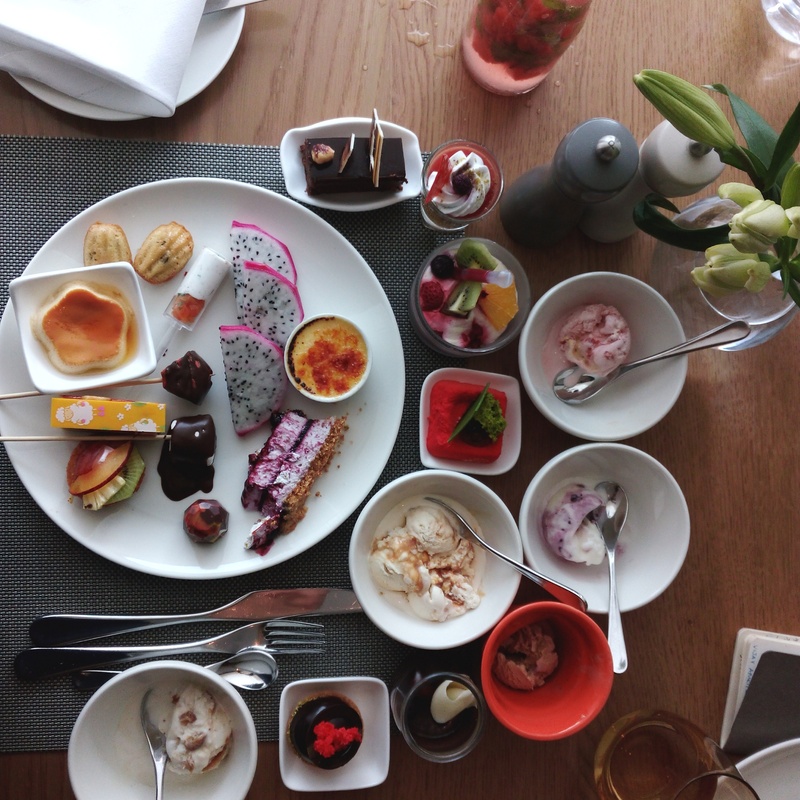 A plate piled high with fresh seafood, sushi and a glass of champagne was the start to a very fulfilling brunch. My plate had: Salmon Roll, Salmon Nigiri, California Roll and Yellow tail Maki from the sushi section, Scallop and Prawn Ceviche, Gazpacho with Shrimp, Calamari and mussels from the fresh seafood section. My plate below will hopefully convey what I feel words will do injustice to. My next attack was on the Asian Oriental section. I absolutely love Asian flavours and was keen to try the healthy section which is the Soup counter. Make your own soup by choosing ingredients from various noodles, vegetables and meats. The chef at the counter will then blanch these ingredients while you choose your broth. That day we had the option of Celery and Leek or Tom Yum. I tried both and the Celery & Leek soup hit all the right spots. The next item on my health binge was some Dim Sum. We tried the Broccoli & sesame seed, Lamb & black pepper and pokchoy wrapped Prawn dim sum. The prawn dim sum was mind-blowing. Perfectly seasoned prawn wrapped in a layer of pokchoy – the absence of flour makes this a super-healthy option! I wasn’t planning to try the Indian food because you know, how different can it get? Yet, when I walked past the Biryani station I couldn’t help picking up a plate and spooning a bit of each – Mutton, Chicken and Prawn biryani onto it. The visual indicator of the biggest handi with the least quantity says that Mutton was the most-loved Biryani of all. And, it truly was lip-smacking! I had also managed to cram some Fish tikka, Paneer tikka and Chicken Pudina tikka onto my plate all of which were pretty good. 1. Crème Brûlée – Oh! That crack followed by the creamiest custard inside. The portion just about enough to drive you mad with wanting at least 10 more! 2. The Chocolate hazelnut cake was absolutely divine. 5. Choco lava cake made fresh on request was sinful and so good. 7. The Chocolate Fountain – brings out the child in everyone and those who disagree are quite frankly lying. It is hard not to pick up a marshmallow and dip it in there! As you can see I tried a whole heap of desserts to give you my top picks. This buffet was indulgent, decadent and luxurious. A bottle of Moët & Chandon champagne, nestled in crushed ice, that was poured for us at near-empty intervals kept us hydrated through the meal. All packages include complimentary access to the swimming pool.